This weekend marks our 3rd wedding anniversary, we've decided not to buy each other presents and instead have each made something for our home to celebrate the occasion. We are having a quiet weekend at home together and T is off to my sisters for a sleepover with his cousin. 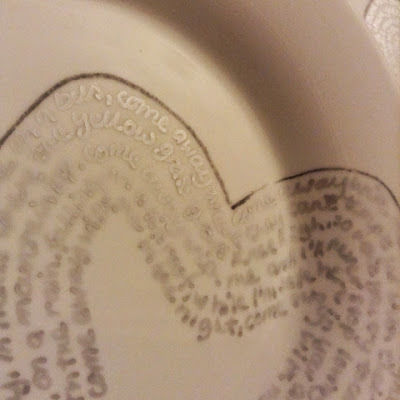 For my 'gift' I decided to make some anniversary plates that we can use every year (hopefully!) 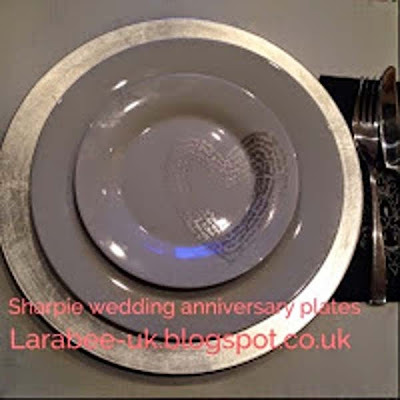 I bought some really cheap sainsbury basics plates and a silver sharpie pen. I started out by practising writing the words to our favourite song on my template, that way I had a rough guide as to where the words would need to be. 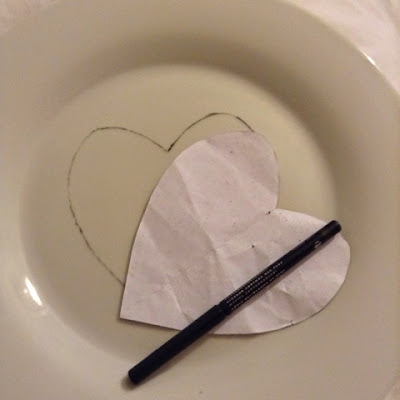 Then I drew a heart on my plates using my template and eyeliner. Once I'd done that, I was ready to get writing. My writing isn't as neat as I'd have liked because the pen was thicker than I expected but I got all 4 plates written. I decided to work in a clockwise pattern around the heart but there are many other options if you don't like that idea, pinterest has loads of examples! Once the writing was complete, I used the cotton buds to carefully rub the eyeliner off. 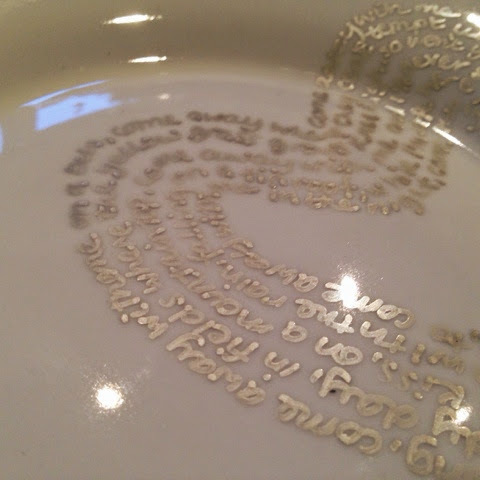 I then baked the plates at 180oC for 30 mins, I've given them a little wipe and nothing has come off, and of course I will wash them by hand rather than pop in the dishwasher. Edit: I have a follow-up post here to tell you how these are holding up to being used. As always apologies for the rubbish photos, our lighting is so pants, I really need to learn how I can try and work with it rather than against and improve my photos! Thanks so much, wish my photos did it more justice. Super easy too!! That's a great idea and something you can cherish.